There is always something special about appearing in the newspaper. Better yet, your local paper that is read by thousands of people. 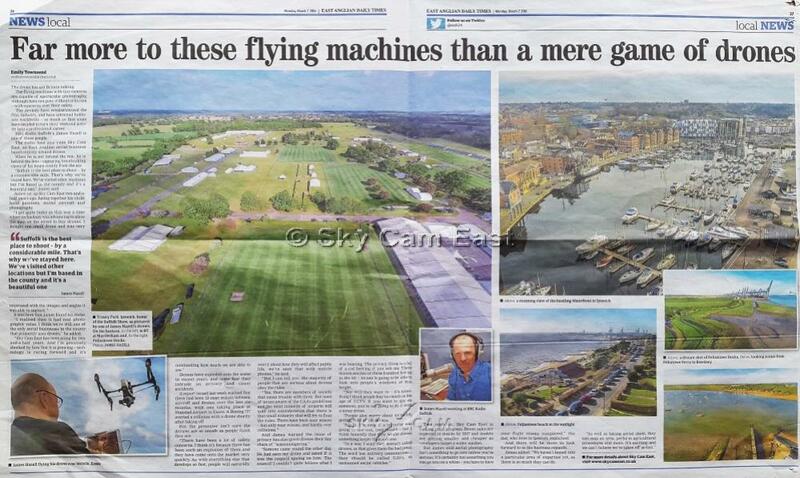 We were delighted to be contacted by the EADT with a view to a two-page feature on us – a young Suffolk business. Reporter Emily Townsend was soon on the phone firing a wide range of questions at us. Included in her queries, quite rightly, were the issues surrounding safety and privacy where ‘drones’ are concerned. Hopefully our responses will be some sort of reassurance to those who believe that drones are only used by spies and terrorists – and those seeking to down a jet liner. The positives are of course many fold and it is our hope that as the technology becomes more familiar and safety is taken seriously by ALL pilots, those positives will be of benefit to many people. Our thanks to the East Anglian Daily Times for their interest – no doubt our work will continue to appear in that paper in the future. Hi. Unfortunately the EADT paper with your feature in has got thrown away. Are you able to email us a copy or provide a link to download it please? Do you offer any training for drones? Sadly we do not offer training at this time.